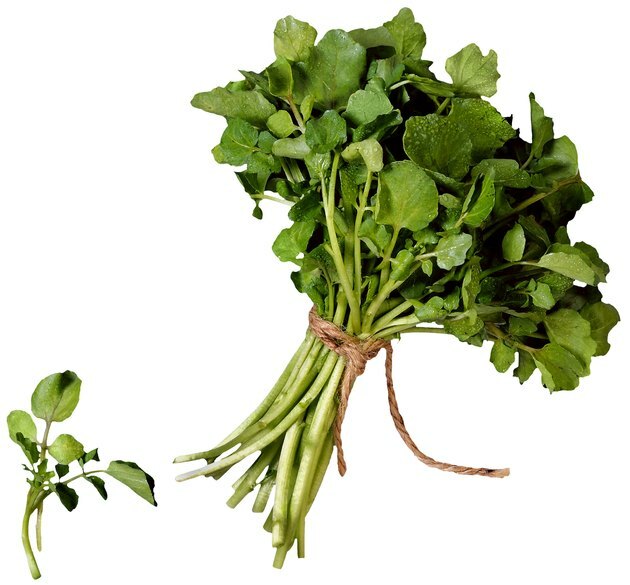 Watercress, as the name implies, is a water-loving plant that does very well when grown in hydroponic systems. Although hydroponics can be expensive when you're just getting started, it doesn't have to be. Many plants, especially those like watercress that do best when wet, thrive in a simple floating system that you can make from a few readily available materials. Watercress is an easy hydroponic crop. Cut a series of holes in the Styrofoam sheet. Size these holes to fit the rock wool plugs to hold them in place so that they won't fall through. Space them so that they are about 3 inches apart on all sides to allow room for the plants to grow. Don't make any holes closer than 2 inches to the edges to prevent the holes from weakening the Styrofoam. This raft will support your growing plants. Fit one rock wool plug into each hole. The plug should fit snugly. If it seems loose, try adding some water to it so that it expands in place. You can also pack around it with cut pieces of rock wool or cotton balls. Place the bin in an area that gets several hours per day of sun, but that also has plenty of shade. You can also grow watercress indoors by hanging standard fluorescent lights about 4 inches above the growing plants and keeping them on about 12 to 14 hours a day. Fill the bin to within 3 inches of the top with hydroponic nutrient solution. You can buy concentrated nutrients and then mix them according to the manufacturer's instructions or you can make your own mix. To make your own, add 1 teaspoon of Epsom salts and 2 teaspoon of water-soluble 20-20-20 fertilizer with micronutrients to every gallon of water and mix well. Connect the air hose to the air stone and the air pump. Place the air stone in the bottom of the bin. This will oxygenate the nutrient solution, getting air to the roots of the plants and helping them to grow. Set the pump where it won't get wet and plug it in. Float the Styrofoam raft on the nutrient solution. Put watercress seeds in the small cavity on top of each of the cubes and cover with a few crumbled bits of rock wool. The plants will begin to grow quickly and you can harvest them when they reach the desired size.